EasyList Whenever I go out, I try to make a list of what I am supposed to do or get otherwise I forget. Inevitably I am leaving that list in the car or even worse, on the counter at home. I pretty much always have my phone though. I did try to use the notes app or other substitutes, but I wanted something that was easier to use and designed with the list writer in mind. I wanted it to be as close to writing on a piece of paper as it could be on the phone, but better. Because I usually have more than one place to go, it needed to support multiple lists. I wanted to be able to easily see if I have picked up the item on the list or accomplished the task so it needed an indicator of completion. I wanted the lists to be flexible, easily edited and rearranged to my needs. 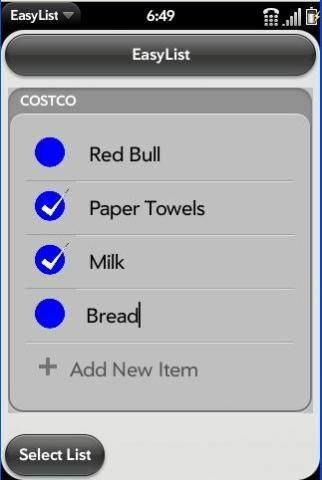 Sometimes I get the same thing from a store weekly so I wanted to be able to reset whether it was completed or not so I could reuse a list or maybe several items on the list. Most of all I wanted it to be simple to use. If it was too complicated I did not think I would use it. From this came EasyList. EasyList allows you to: -	List out many items, even multi-line items as needed on each list -	give your lists meaningful names for your needs -	store multiple lists for different needs -	check off completed items -	rearrange items in order of importance -	reuse and edit old lists as wanted, just uncheck needed items -	delete items that are not needed anymore -	delete whole lists if not needed anymore I have been using EasyList for a while now and it has gone through several iterations. I hope you test it out and that you find it as useful as I do. If you have any suggestions for increasing the usability, I am interested to hear them.